Blanc and PSG showed why they are underrated with a good performance away to the European giant Real Madrid. Los Blancos displayed some worrying qualities on defense while PSG seems to have improved their possession game since the previous season. PSG had some problems in defense as well, but their use of the ball resulted in a match where they were very unlucky to lose 1:0. Systems for most of the match (after the injuries). 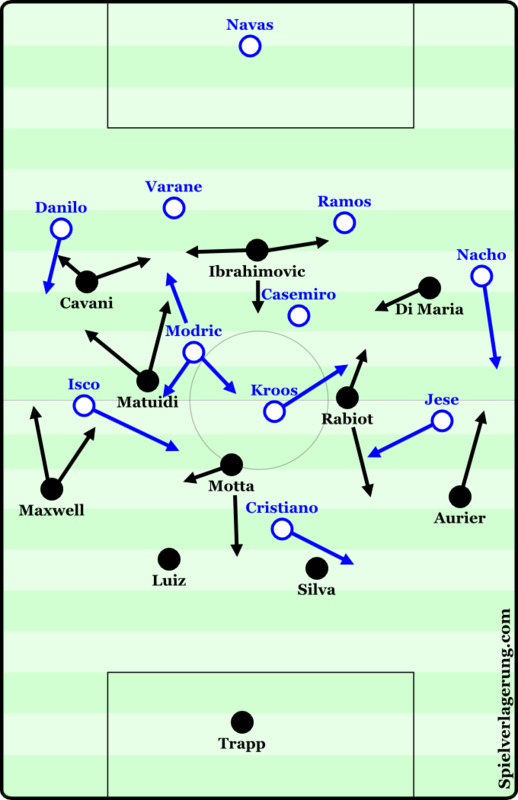 In the early stages of the match it was obvious to see that both teams used a 4-4-2 zonal pressing scheme – with PSG’s stemming from their usual 4-3-3 shape and Madrid’s coming from a 4-4-1-1 shape with Kroos as the 10. It was PSG who pressed higher up the pitch and sought to win the ball back quickly, but their successful zonal pressing lasted only for the first 15 minutes (until Veratti came off injured for Rabiot). Veratti was the one who would join Ibrahimovic in the front pressing line to form the 4-4-2, but once Rabiot came on it was quite clear Blanc’s team switched to man-marking 3 vs. 3 in the midfield. While PSG were still using their zonal pressing scheme their defense was good enough to cause problems for Real Madrid. Still, problems arose because the PSG wingers clearly man-marked their opposing fullbacks and would get pulled quite wide (and not shift towards the ball as much) due to their positioning being determined by the opponent position. This opened up the halfspace for penetrative passes (Kroos and Modric were particularly great at combining and dribbling in these areas) and led to a few Madrid chances – especially after switching the ball from one flank to another. This led to PSG being forced deeper more often and it took longer for them to regain control of the ball and space on the field. Problems arose for PSG when they man marked in central midfield. Ibrahimovic was outnumbered 2 vs. 1 against the two Madrid central defenders which led to problems in regards to access in itself, but it was the structure which Real typically creates in possession that caused big problems for PSG (especially when Modric was involved). Kroos would drop from his 10 position towards his favored left halfspace while Casemiro played as a pivot in the center and occasionally dropped between the 2 central defenders. Modric operated in his favored right halfspace while the 2 fullbacks pushed higher up the field in order to provide options for safe passes to the flank to gain a bit of space before returning to the center. Because Real played in a structure in which Kroos and Modric dropped diagonally into the defensive line it created a huge distance which the PSG man-markers had to cover to maintain access to their main point of orientation (the opponent). This is a common and successful tactic against man-marking central midfielders as it either forces them to lose coordination and stop man-marking or to follow the opponent so far out of their position that it completely opens the center (the latter happened to Blanc’s men). Many times Real would stretch the PSG shape and then play the ball through their midfield and into Ronaldo, Jese, or Isco with the FBs making runs as well – this resulted in some potentially dangerous scenes. One scene in particular had Ramos free on the ball while Casemiro and Modric were being man-marked quite deep. Ramos approached Di Maria while Marcelo moved higher up the pitch which forced him into a 2 vs. 1 and into a decision on what to do. He decided to pressure Ramos and Ramos immediately played the ball into Marcelo in midfield. This was a huge problem because Motta was the only player left in midfield (as Kroos didnt drop so deep in this scene) and he decided to leave his position and move across the entire field to establish access to the ball. Though the time it takes for him to reach Marcelo on the flank is already too long and Marcelo could decide on his action and exploit the spaces. Marcelo had great false fullback-like movement before he was injured. Because PSG’s central midfielders were pre-occupied man-marking their opponents, when Marcelo made the movement towards the center of the field and was left unmarked by Di Maria (as this is a really strange defensive movement – especially for a winger, to move away from the ball to follow their mark during a press) it allowed players like Ramos to play vertical balls into the forwards and for Marcelo to receive a lay-off pass and begin dribbling inside diagonally, which was a great situation for Real Madrid considering Marcelo’s creative ability and the disorganized PSG structure. Using fullback runs is one of the easiest and simplest ways to take advantage of horizontally organized defenses (defensive, midfield, and offensive lines of pressure) as most players do not want to leave their line and join another defensive line – especially when using a high line which looks to play offsides. Line-breaking runs are very efficient in this sense, and its mostly a result of coaches simplifying defending into lines rather than covering the valuable spaces. This is most apparent in the situations where Marcelo or Aurier make a run which their opposing winger doesn’t track and it causes an immediate overload near the ball which leads to penetration towards the penalty box and dangerous situations. Lack of compactness or backwards pressing results in much easier penetration for PSG. Even though Real Madrid used zonal defending for most of the match (and therefore weren’t as easily manipulated defensively resulting in more control of the game in that sense), they still had worrying signs in their movement out of possession. The front two in particular completely lacked the coordination needed to stop PSG from gaining space or backwards pressing once they were bypassed. We can all expect this from Cristiano Ronaldo defensively, but it was somewhat surprising that Kroos was experiencing similar problems. On defense these two didn’t do much, which might be because Benitez possibly told them to remain higher up the pitch (along with Jese) in order to make their counter-attacks more dangerous. This type of “rolling the dice” can have extremely negative effects defensively when facing any team which is competent in possession of the ball. In the above image a scene from the game is highlighted where Kroos attempted to press on the left but was simply too outnumbered to impose any sort of stable pressure while Ronaldo simply did nothing. This led to a pass into Motta completely unpressured in front of the Madrid midfield – resulting in time and space to create. Madrid’s wide midfielders also seemed to be attached to their opposing fullbacks (which wasn’t as common under Ancelotti), leaving Modric and Casemiro to cover the center and halfspaces of the field. Because they both shifted towards the ball, a diagonal ball from Motta into the left halfspace where Matuidi was positioned resulted in easy penetration of the Madrid midfield and led to a dangerous chance. Madrid’s defense was in many ways less reactive and more proactive than PSG, but their lack of proper compactness, backwards-pressing, or ball-oriented movement in some situations resulted in dangerous attacks for PSG. These qualities in defense are worrying to see from Benitez (*though it is my first time seeing his Real Madrid this season, so this may not be a common occurrence), because of that Los Blancos struggled to keep the ball or the opponent players out of their shape. A strange high pressing structure arose at times where Ronaldo would move towards the left halfspace, Kroos moved into the 9 position and Isco supporting in the right halfspace. Jese remained on the left flank while Casemiro pushed up from his left central position and Modric remained deeper on the right in the center. It wasn’t very coordinated or compact – but it happened rarely. In another scene Ronaldo moved towards the left while Kroos remained in the 10 position. 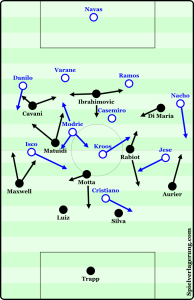 PSG moved into the open left halfspace – but due to the lack of compactness from Real Madrid this wasn’t as successful as their asymmetrical pressing under Ancelotti and it resulted in Modric becoming isolated between pressing the ball carrier or protecting his central midfield zone – and this led to the ball being played into Cavani in the left halfspace quite frequently. At times Casemiro would drop into the defensive line to form a back 5 – leaving Modric completely alone in the center! 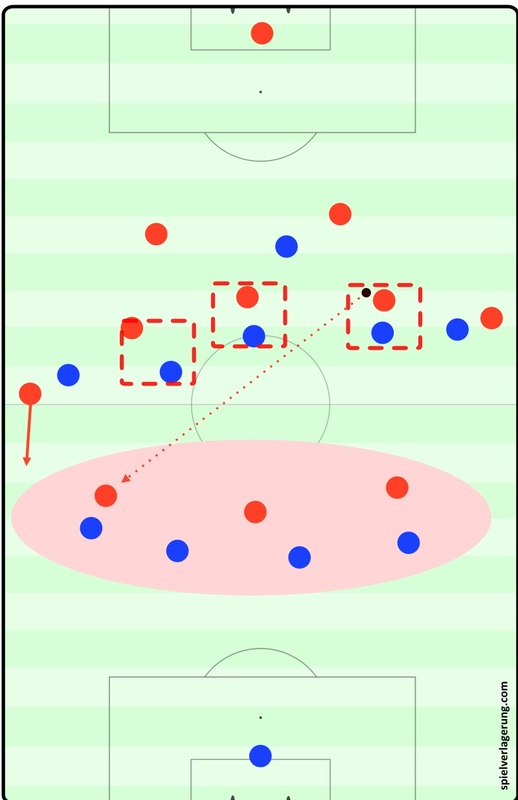 PSG had a structure in the early stages where Motta would either drop between the central defenders or towards the left halfspace while Veratti would move towards the right halfspace. The FBs would push high up the field (both Maxwell and the talented dribbler Aurier were quite dangerous higher up the field) while the two wingers pushed inside. Cavani in particular was quite present in the deeper build-up play during the earlier stages of the game. Maxwell frequently played very good passes towards the center (as well as a cross which barely missed both Ibrahimovic and Cavani) into Ibrahimovc from his wide left position – gaining a lot of space towards the opponent goal and attacking more dangerous areas. On the opposite side Aurier and Di Maria (who was much more central in the second half) would combine quite well, especially when Di Maria would receive the ball deeper and use his offensive dribbling ability to penetrate the midfield and play Aurier’s line breaking runs through the defense. Di Maria also had moments where he utilized his diagonal dribbling very well cutting inside onto his favored left foot, he even played Cavani into a 1 vs. 1 situation against Navas just before halftime from such a scene. PSG’s left side was very fluid in regards to positioning between the flank, halfspace, and the center between the 3 of Maxwell, Matuidi, and Cavani – which was the case last season as well. If Matuidi would move towards the flank and Cavani was in the center, Maxwell would move towards the halfspace. If Cavani was wide and Matuidi was in the halfspace, Maxwell would move into the center. In this way they constantly balanced each other and at times Ibrahimovic (who played excellent combination and lay-off passes throughout the game) would join into the group on the left flank – though he mostly left the near-side flank and moved towards the far post in the box in order to attack a far post diagonal ball (which I feel is under-utilizing his abilities quite a bit!) This caused problems for Madrid’s defensive orientation and marking responsibilities quite often (which was more difficult to cope with due to their worsened defense). In Real Madrid’s structure Nacho and Danilo simply pushed higher up to occupy the flanks while the central midfielders had the movements I described earlier. In regards to the forwards, Isco would move between the right halfspace and a role in which he supported the ball wherever it went – leading to a lot of occasions where he was quite deep instead of positioning between the lines to assist Ronaldo and Jese if a penetrating ball was to happen. Jese most often took up a central position while Ronaldo drifted toward his favored left halfspace position and sometimes even moving towards the left flank while Marcelo was still in the game. Nacho’s interesting goal resulted from a deflected Kroos long shot. Of course the situation was quite strange and there was a bit of luck involved as to how the situation unfolded and how Trapp reacted, but the reason Kroos resorted to a long shot was because of Real’s lack of presence higher up the pitch when in possession. As I mentioned earlier, Isco would more often remain deeper leaving only Ronaldo and Jese to play between the opponent lines (less players to occupy defenders and to combine to penetrate). Because Madrid didnt have enough presence in the center of the pitch in regards to forwards, they had trouble accessing this area and were forced into long shots like the one which resulted in Nacho’s goal. Though in one scene Isco, Modric, Ronaldo, Jese, and Kroos were all in the left halfspace were able to easily combine into PSG’s box and create a chance for Isco which was saved from close range by Trapp. Nearing the end of the game PSG allowed their fullbacks to take up positions as wingers and their wingers to move into the center and join Ibrahimovic. Though Di Maria acted more as an 8 or a 10 than another striker next to Zlatan as Cavani did. This was actually quite a nice structure for PSG and they were able to fashion a few dangerous chances. Lucas eventually came on for Matuidi and moved towards the left flank while Maxwell dropped a bit deeper to stabilize the build-up play in both defense and midfield while Motta, Rabiot and Di Maria played in the center and Cavani, Zlatan, and Aurier finished out the front 4. This 3-3-4/2-4-4 shape resulted in some last minute dangerous counters from Madrid when PSG failed to create a good opportunity, but nothing came of it and the match finished as it was. Overall Madrid seems worse now than they did under Ancelotti, but it is important to give Benitez more time with the team to truly see how they will perform (along with a healthy XI). Though as of this most recent match its possible that Real Madrid could lose its streak of consecutive semi-final appearances in the Champions League if they continue to perform this way. PSG under Blanc played quite while in the early stages while Veratti was on the pitch and they look like a real dark horse in the current Champions League campaign if they can stay healthy have a bit more luck go their way. Both teams definitely look interesting and it will be great to watch how this years Champions League unfolds. By AdinOsmanbasic in Match Analysis on May 20, 2017 .